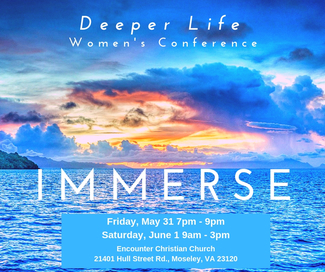 We are thrilled to be hosting Encounter's 3rd annual Deeper Life Women's Conference! We will be gathering May 31 & June 1 for an amazing weekend of surrendered worship, powerful messages, prayer and fellowship. The cost of the entire weekend is $35, and includes lunch on Saturday. We will be exploring what it means to be fully Immersed in Christ Jesus. We are blessed to have Denise Cappuccio, Director of Finance at Concerned Women for America, as our keynote speaker for Friday night's session. Denise accepted the Lord as a young girl when she was growing up on Long Island, NY. However, she found her true identity in the Lord through a season of great disappointment in her twenties. Having learned to trust God during wilderness seasons and find her identity in Him, she now finds great joy in encouraging other believers to do the same. Saturday, we will dive deep as six different ladies of Encounter Christian Church step forward to share what it means to be Immersed in...God's PRESENCE, PURPOSE, PEACE, PROMISES, PRAYER and POWER. We are so excited to hear what God has planted in the hearts and spirits of these women. Let's go deeper! Let's Immerse ourselves in God's spirit!